Concrete repair isn’t something to take lightly. Let’s say, for example, that you manage an apartment complex in Denver. It’s your responsibility to maintain the property to the highest degree. That could mean having a contractor perform some sort of concrete strengthening, concrete crack repair, or other repairs. Though you may want to take on such a project on your own in order to save money, it’s best to consult a professional. That said, not all concrete solutions are the same. 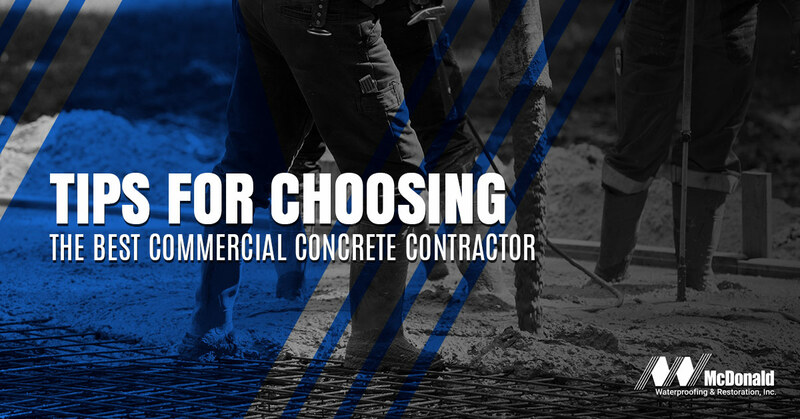 Keep reading for tips on how to choose the best commercial concrete contractor for your job. Ask around – It’s a good idea to chat with coworkers, friends, and neighbors to see if they have any recommendations first. Just remember that not all concrete repair companies are the same. Some only take on residential projects while others prefer to handle larger-scale ones. Be curious – Hopefully, you were able to come up with a list of potential companies to contact. Now it’s time to be picky. The ideal choice should have plenty of available references, the proper certification, and warranties on their work. It doesn’t hurt, either, if a company is willing to provide a written proposal that includes start/end dates in addition to a payment schedule. Weed out those with a poor reputation – Don’t forget to check with the Better Business Bureau to see if customers have filed complaints against local concrete contractors. You want to avoid having to work with a shady company that won’t do a good job. Value experience – If you’re only going to follow one piece of advice here, it’s this. While you may be on a tight budget, it’s imperative to hire a concrete solutions team that has experience. At McDonald Waterproofing and Restoration, we’ve been helping those in the Mile High City for nearly two decades. Through the years, we’ve established ourselves as the go-to specialty repair company in the Front Range. Understand your contract – Take your time reading through the contract. Prior to the company starting their work, be sure that every detail of the repair is covered. If you have any questions, don’t be afraid to ask. McDonald Waterproofing & Restoration is proud to be locally owned and operated. Led by industry leaders, we have garnered a reputation for innovative communication processes and extremely high satisfaction. Frankly, it’s no secret as to why. For one, we focus on solutions that deliver the best possible outcome in the most cost efficient manner. Our team doesn’t believe in taking the easy way out through a “band-aid” approach. Time and time again, we’ve seen a concrete repair job look fine initially, only to fail just months later. Rest assured that McDonald understands concrete inside and out. We combine our experience with the best technology to provide clients with a long-term solution that actually saves clients money. Don’t let your concrete dilemma only get worse and cause structural damage. Instead, call the team with more than 70 years of experience. Call McDonald Waterproofing & Restoration today.